As the fall semester ends, so do the Brown studies of 119 undergraduates who completed their degree requirements at midyear. The “.5ers,” each with a unique story to tell, were honored at the 2015.5 Midyear Completion Celebration Dec. 5. PROVIDENCE, R.I. [Brown University] — As fall semester began September 5, 2014, senior Haley Scott came back to campus, but she wasn’t at all sure she’d stay. Over the summer she had worked on the Congressional campaign of Democrat Seth Moulton, and the primary was Sept. 9. If voters in the sixth district of Massachusetts so chose, she’d have a lot more work to do for the campaign through Election Day and a subsequent swearing in. Moulton prevailed and Scott, who had been an intern and then a field organizer over the summer, took the fall semester off from her studies at Brown to return to Moulton’s general election campaign as deputy and then interim finance director. With Scott’s help, Moulton won the seat, and Scott resumed her Latin American history concentration at Brown in January 2015, wrapping up her senior-year studies this month. Each .5er (“point-fiver”) has had a different experience leading to the midyear completion. Some students transferred to Brown. Others resumed their undergraduate education after an extended hiatus. Many, like Scott, took a semester off to pursue an outside interest. Working on Moulton’s campaign helped her land her first job after Brown. She’ll serve as finance director for the newly declared Congressional campaign of Delaware Democrat Sean Barney. In 2013 Riwaj Thapaliya, who observes the Baha’i faith, became inspired at a spiritual conference in Boston to perform service by helping a marginalized population of refugees, including many from his home country of Nepal, who had been resettled in the Dallas area. 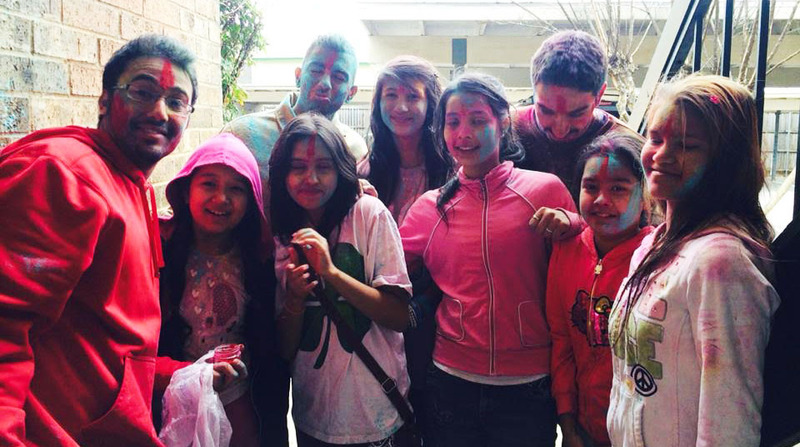 Riwaj Thapaliya (left) worked with youths from Nepal and other countries to teach English to older and younger members of a community resettled in Dallas. Thapaliya worked during the spring semester and following summer of the next year as a coordinator for the Regional Baha’i Training Institute, finding ways for the culturally isolated refugee neighborhood to tap its own strengths. Recognizing, for example, that teens and young adults in the community had been successful in learning English, he helped organize workshops to train them to teach English to their elders and to younger children. A biology concentrator, Thapaliya now has a job with a health care consulting firm and ultimately plans to study medicine. He said the experience helping refugees has informed his interest in the anthropological aspects of global health. “Living with the people that I was working with ... correlated with my interest in working with people and working at the grassroots level of people and organizations,” he said. For Chanelle Adams, completing midyear was a matter of wanting the time to savor the broad range of her studies and other pursuits. Her science and technology studies concentration in an individually designed thematic track called "ecologies of knowledge” has been intense. In 2013, for example, she spent a semester in Madagascar studying how traditional medical practice in small villages on the island, such as the use of medicinal plants, contributes to global health knowledge. She returned there for followup research earlier this year. 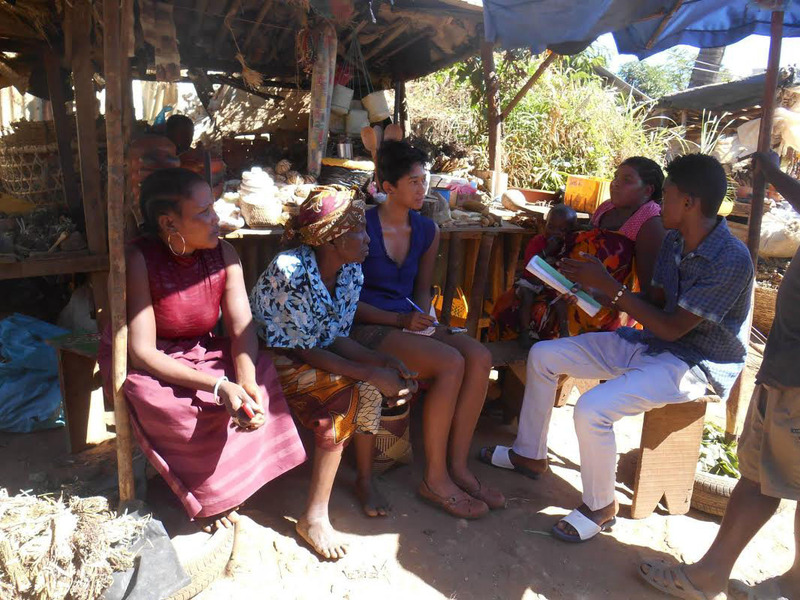 Chanelle Adams talks with medicinal plant vendors in Madagascar. She made more time for her studies and outside interests by going part time and finishing midyear. Meanwhile, her other interests led to her plans after Brown. After activities at Brown including co-founding the feminist website bluestockings and scriptwriting for the educational video series SciToons, Adams now works as the managing editor for the website Black Girl Dangerous and does additional freelance writing and editing. With unique ambitions and interests, the 2015.5 students found the flexibility at Brown to achieve them their way.